This meal revolves around my Chinese Brown Sauce.The Chinese Brown Sauce is so versatile. I have used it to make Asian Noodles, Asian Lentil Meatballs and various other ways. For this meal the tofu and asparagus are glazed with this sauce and are placed on a bed of brown rice and millet ramen – YUM! Note: To trim the asparagus, take the asparagus by the ends and bend the asparagus. It should snap apart. The bottom of the asparagus where it breaks off is usually tough and woody. It is not very pleasant to eat. I do not use this part. You could save it to make broth if you so choose. Preheat oven to 400 degrees. Line a baking sheet with parchment paper. Cut tofu into 1/2 inch slabs. Place tofu on half of the baking sheet. Glaze the tofu with the Chinese Brown Sauce. Reserving the other half for the asparagus. Bake tofu for 20 minutes. Add asparagus to the tofu. 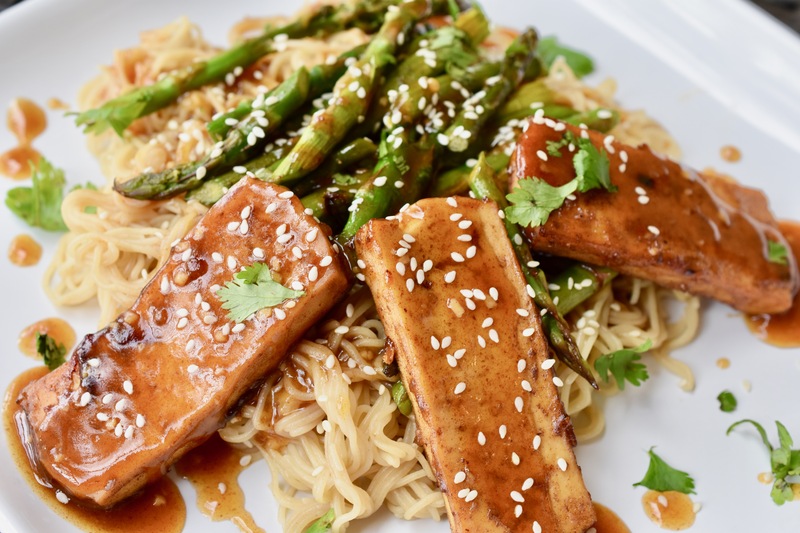 Brush the tofu with the Chinese Brown Sauce and drizzle some of the sauce onto the asparagus. Bake for 10 minutes. Remove from oven and set aside until plating. While the tofu and asparagus are baking in the oven make the brown rice & millet ramen cakes according to the package instructions. Drain ramen. Note: I like to make my ramen with half water and half vegetable broth. the broth infuses flavor into the noodles. Layer your plate or bowl with ramen noodles, asparagus and tofu. Drizzle some Chinese Brown Sauce on the top. We love the Lentil Meatballs. I adapted the recipe for JB so they could have some too. This is an Asian version that is just – WOW! Combine eggplant, mushrooms, JB’s All-Purpose Blend , pecans and oat flour into a food processor. Process until the ingredients are well incorporated. Add lentil, coconut aminos, GF All-Purpose Flour Blend and GF oats to the food processor. Process until all the ingredients from the first blend and the second blend are completely combined. Refrigerate for 30-60 minutes for the ingredients to firm up. Preheat oven to 400 degrees. Line a baking sheet with parchment paper or a silicone mat. 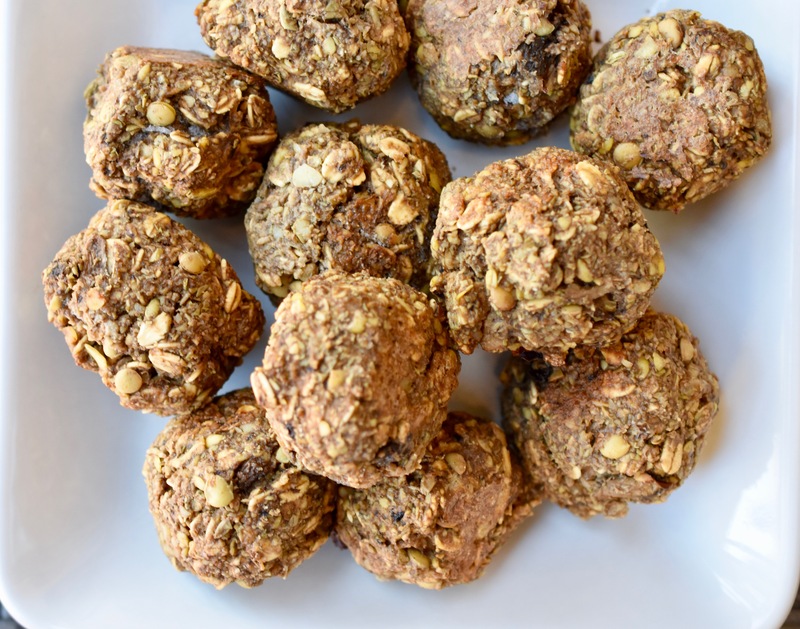 Form the lentil mixture into walnut size balls. This recipe makes about 36-42 lentil balls. Place the lentil balls onto the prepared baking sheet. Bake for 10 minutes. Turn lentil balls over and bake for an additional 5 minutes. 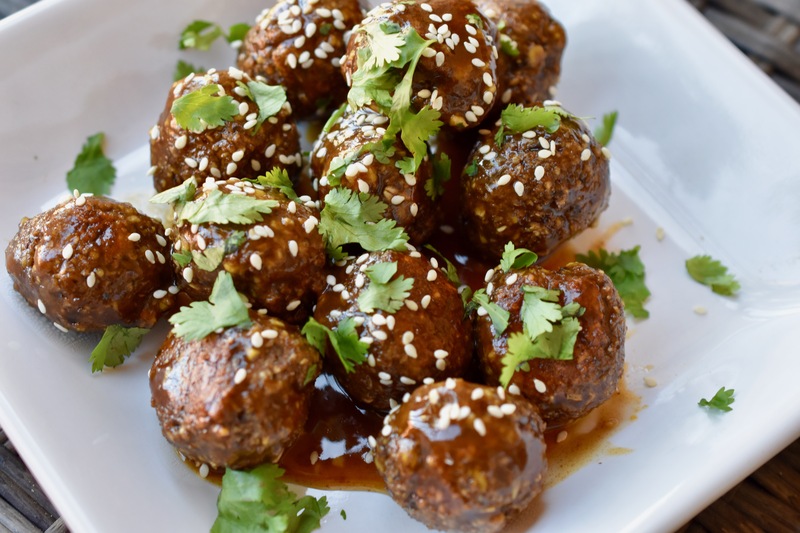 Make 1-2 recipes of the Chinese Brown Sauce to coat Asian Lentil Meatballs. Serve with brown rice and Chinese Brown Sauce. Note: These would make great appetizers, potluck dish, or even for game day. 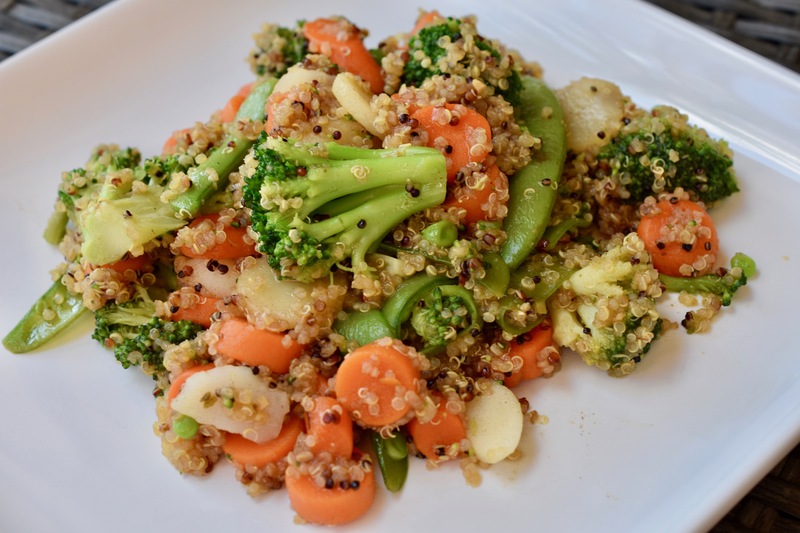 This Warm Asian Quinoa Salad was so simple to put together because I had everything already made. I had done some batch cooking sometime ago and had quinoa in the freezer. Also, I had an Asian vegetable mix in the freezer and my Chinese Brown Sauce in the refrigerator. That is basically how I came up with the salad. It pays in time saved to batch cook. Cook vegetables according to package directions. Warm quinoa, and Chinese Brown Sauce. Combine all of the ingredients in a large bowl. Stir until the ingredients are well incorporated. Note: This salad is also good served cold or at room temperature. I made this pasta salad for JB (one of my clients) who has limited food choices. It is protein packed with pinto and kidney beans. Also, I used chickpea pasta. It is lightly dressed with lemon, tahini and some fresh herbs. 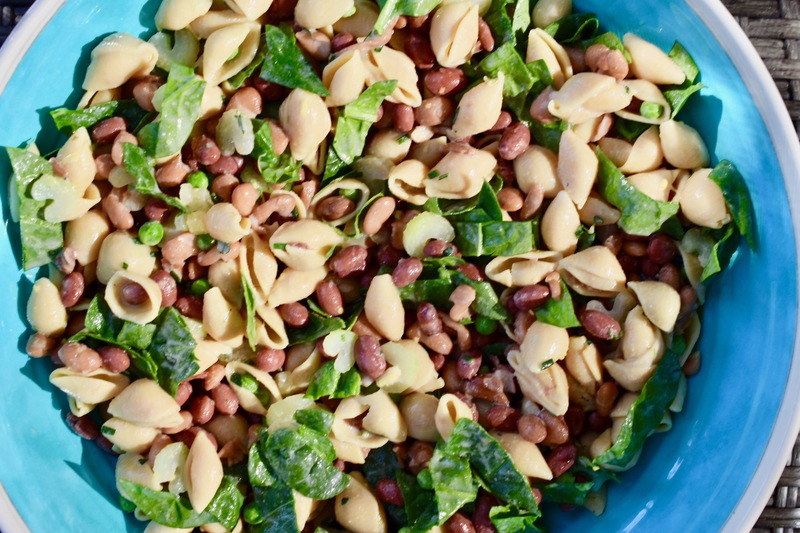 This pasta salad would be great to bring to a gathering. For a pop more color add some multicolored tomatoes or some corn. You will be taking home an empty bowl. Blanch the celery in boiling water for about 2 minutes. The celery’s green color will brighten. That is when you take it out and shock it in ice water. Remove the celery from the ice bath. Set aside. Cook the shells according to the package directions. I always cook the Banza pasta at its lowest suggested cooking time. This keeps it from falling apart so easily. Combine pasta, veggies, beans and herbs in a large bowl. Whisk together dressing ingredients into a large measuring cup. Drizzle over pasta mixture and stir to coat pasta. Note: This recipe makes a large bowl. It would be great for food prep for your lunch during the week. I had some jackfruit and mushrooms leftover from making JB’s Jackfruit Hand Pies and decided to veganize one of my favorite dishes I use to order when we went out for Italian. The restaurant version would have chicken and Alfredo sauce. I veganized it with jackfruit for the chicken and I used my Cashew Béchamel – Basic White Sauce for the Alfredo. It was a hit. Cook farfalle according to package directions. Drain and set aside. 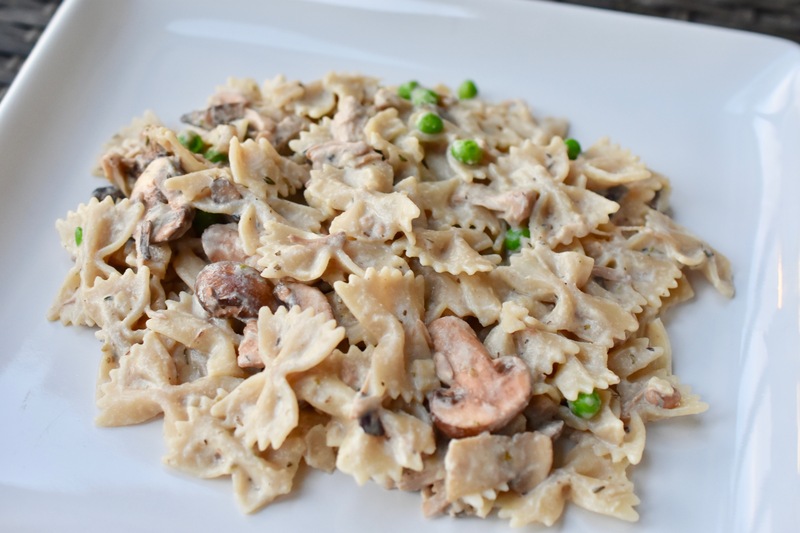 In the same pot you cooked the farfalle in, add the Jackfruit and Mushroom mixture, mushrooms, peas and generous amount of All-Purpose Seasoning. Sauté the veggies until the mushrooms have softened a little, about 5 minutes. Add the farfalle, Cashew Béchamel – Basic White Sauce and vegetable broth to thin the sauce as needed. Stir all the ingredients together until completely mixed. This recipe makes 4-6 servings, depending on serving size. This was an easy to throw together meal. I had the penne in the pantry and both the Creamy Tomato Sauce and the Lentil Meatballs in the refrigerator waiting to be used. Everything could be assembled ahead of time so when you got home from work you could pop it in the oven and in 30 minutes a meal is ready. Just enough time to get yourself comfy. Note: I would make a full recipe of the Lentil Meatballs and freeze half the recipe for another time. Cook penne according to package directions in a large dutch oven. Reserve about a coup of the penne liquid before draining the penne. 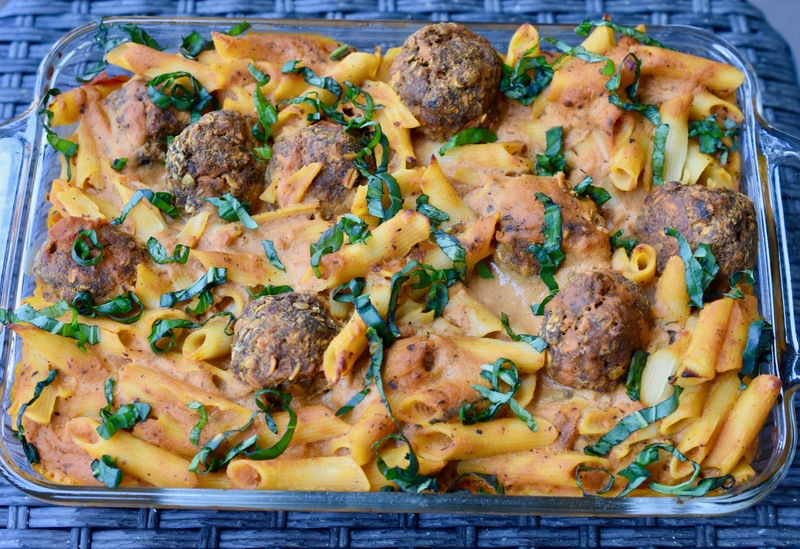 In the large dutch oven that you cooked the penne in, combine the penne, Creamy Tomato Sauce, Lentil Meatballs and nutritional yeast. Add pasta liquid as needed. You want the sauce a little soupy because the penne will soak up some of the sauce as it bakes. Bake for 30 minutes. Garnish with some fresh basil. This would be great served with my Easy Focaccia Bread. I made these because I was wanting to try my hand at using lentils in a different way. There is no need to cook the lentils before making the meatballs. By soaking them the lentils keep their texture, yet are tender. This is one of those combine everything together type of recipes. One of my favorite kinds. Combine onions, mushrooms, All-Purpose Seasoning, walnuts and nutritional yeast into a food processor. Process until the ingredients are well incorporated. Add lentil, tomato paste, GF All-Purpose Flour Blend and GF oats to the food processor. Process until all the ingredients from the first blend and the second blend are completely combined. Form the lentil mixture into golf ball size balls. This recipe makes about 24 lentil balls. Place the lentil balls onto the prepared baking sheet. Bake for 15 minutes. Turn lentil balls over and bake for an additional 10 minutes. Serve with pasta and a favorite sauce, or in your favorite grain bowl. 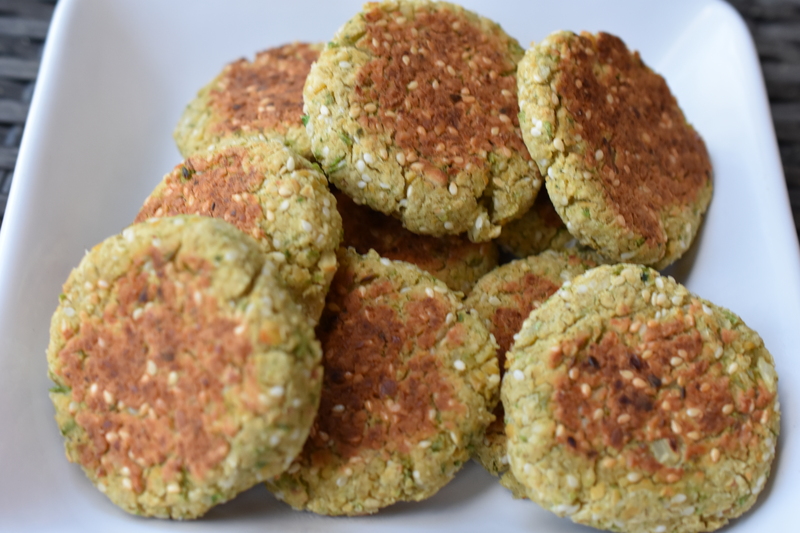 I like to make a batch of Falafels and use them to make different kinds of meals. I made this bowl with part of a batch of Chickpea-Pea Falafels. This bowl had the perfect combination of ingredients. This recipe makes 2 servings. Layer all the ingredients in a bowl and top with your favorite sauce. I like the Creamy Cilantro Sauce or maybe the Green Goddess. This recipe is easy and adaptable to go with your likings. It is a twist on my Easy Falafels GF/Vegan. The mixture ia all made in the food processor so there is minimal cleanup. I always like minimal cleanup. Note: You can use the canned variety of chickpeas, however, make sure they are rinsed and drained. Note: Oat flour can be made by grinding rolled oats into a spice grinder or food processor. Combine all the ingredients into the food processor and process until it is thoroughly combined and resembles a crumbly dough. Transfer to a bowl and cover. Refrigerate the dough for 1-2 hours. The refrigeration helps the dough to firm up and the falafels hold together better. Form dough into 12 little patties. 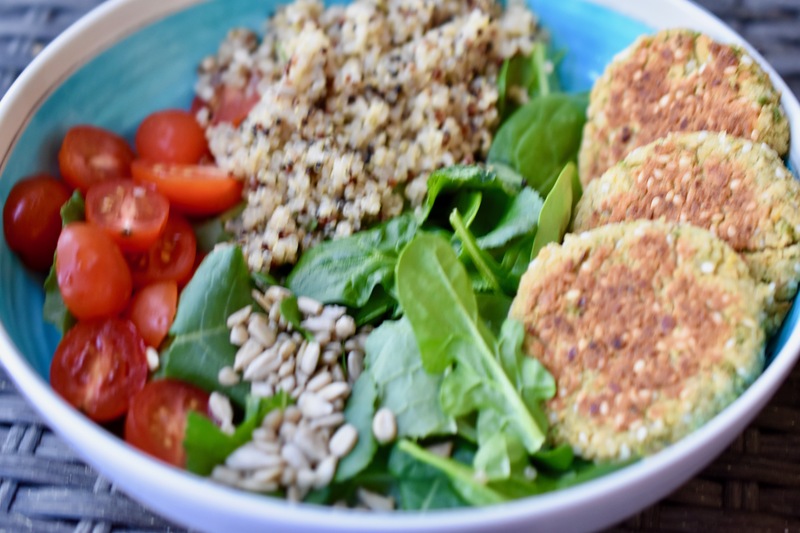 Cook the falafels over medium heat in a non-stick skillet. Make sure the skillet is hot before you put the falafels in the pan. Cook each side until a deep golden color. This is a flavor packed 30 minute meal. The roasted tomatoes add so much flavor that just bursts in your mouth. 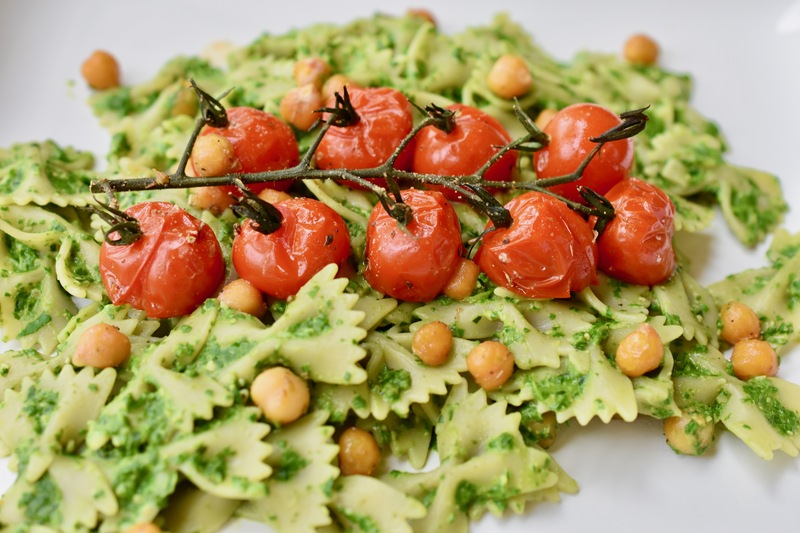 The roasted chickpeas add a wonderful texture to the farfalle. The Spinach Pesto not only adds flavor, it adds tons of nutrients. I love when you can make delicious feel good food in 30 minutes. Preheat oven to 400 degrees. Place the tomatoes on a non-stick or parchment lined baking sheet around the edges and the chickpeas in the center of the baking sheet. Sprinkle All-Purpose Seasoning on top of the tomatoes and chickpeas. Roast the tomatoes and chickpeas for 25 minutes, stirring halfway through the roasting time. While the tomatoes and chickpeas are roasting bring the water for the farfalle to a bowl. Cook farfalle according to package directions. The Jovial brand takes 10 minutes to cook. Make the Spinach Pesto while the water is coming to a boil, and the tomatoes and chickpeas are roasting. Drain pasta and return to pot the pasta was cooked in. Add the Spinach Pesto, roasted cherry tomatoes and chickpeas. Stir until all the ingredients are well combined. This is great with my Easy “Cheesy” Focaccia Bread.